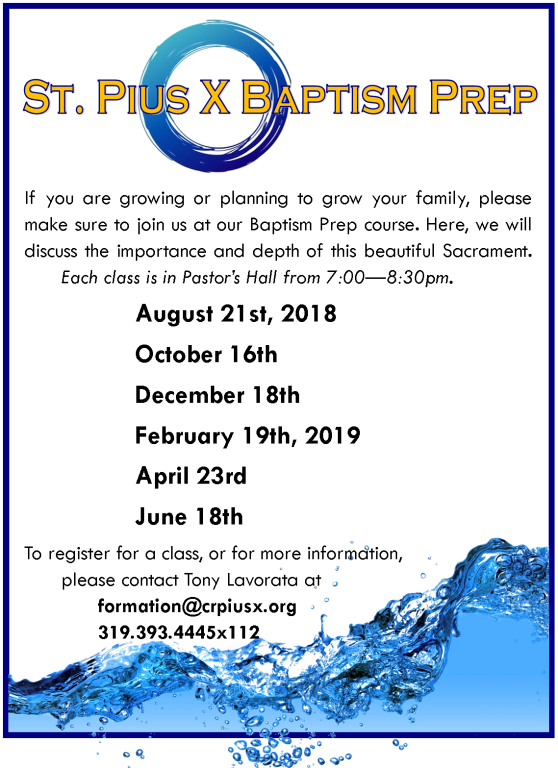 St. Pius X Catholic Church celebrates the sacrament of Baptism regularly throughout the year, except during Lent and on occasional weekends when other special events are scheduled. Like all sacraments, Baptism is a celebration of the whole Church and should take place within our parish community. For this reason, we usually celebrate Baptisms during a Saturday evening or Sunday morning Mass. However, it is possible to schedule a Baptism after a Saturday evening or Sunday morning Mass if a priest or deacon is available. In order to baptize an infant or child, at least one parent must be baptized Catholic, registered in the parish and is participating in the spiritual and sacramental life of the Catholic faith community. The Baptism of an infant or child presumes that the Catholic parent(s) are able and willing to be actively involved in the religious formation of their child. Parents are expected to participate in a preparation class and to participate as fully as possible in continuing education and formation opportunities for Catholic adults and parents. One preparation session is required for parents, unless they have had a prior preparation class within the past three years. Please call or email Anthony Lavorata with questions or to schedule your next Baptismal Prep Class, 393-4445, Ext. 112.